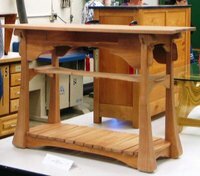 This course is suited for the avocational woodworker interested in producing high quality cabinets or furniture. It is ideal for beginners as well as aspiring craftsmen. Topics include project planning, materials, machines, and power tools with an emphasis on safety. Students will plan, and select appropriate materials to complete a cabinet or piece of furniture. Student projects will be discussed at the first class meeting. Previous woodworking experience is helpful but not necessary in order to take this course. Please read: No class 2/16, 3/23 and 4/20.